Striker Jack Langford hit a double hat-trick in Lancing Football Club's 8-4 win at home to Little Common in the SCFL Premier Division on Saturday. The forward more than doubled his tally for the season as he moved on to 11 goals and now has his sights on reaching 25. On the match itself, Langford said: "It was a mad game. We've had a bit of a rough couple of games recently so going into the game we tried to brush that aside and go forward as a team. "My job is the easy job, it's the team work that makes me look a little bit better. Six is a bit of a bonus, it's nice to score goals but the win was more important and getting points on the board." Langford jumped up the SCFL Premier Division goalscoring chart on Saturday and now finds himself joint second in the division with ten goals, two behind Newhaven's Lee Robinson. When asked if six is the most he has scored in a game, he said: "When I was younger I got four or five, but six is the most I've ever got. "There's a few good goalscorers in this league so to be up there with them, it's been a good weekend for me. "For me personally I don't have a target but I keep tally of how many goals and assists I do get. I like to keep a mental target. I don't care who scores, I just care about winning. Anyone who knows me knows I hate losing. "But a reasonable target is 25 league goals, that would be fine for me." Lancers had been without a league win since the opening day of the season but Langford started as he meant to go on. He opened the scoring after two minutes before adding another with less than 15 minutes on the clock. Little Common pulled a goal back before having a player sent off, which left them with ten men for the remaining 70 minutes. The travelling side almost clawed their way back on level terms, but goalkeeper James Shaw was on hand to deny them an equaliser from the penalty spot on the stroke of half-time. It took five second half minutes for Langford to complete his hat-trick. More goals from Langford (two), Matt Daniel and Finley Pittock saw Lancing stretch their lead to 7-2. Keeper Shaw was sent off for dissent after conceding a third goal, before Langford sealed his double hat-trick three minutes from the end. Little Common completed the scoring when they made it 8-4 late on. Lancing boss Mark Pulling said: "It was a weird game. I'm hoping we don't get too many games like that over the season. "It was good as a spectator but from our point of view to concede four goals when you're winning comfortably is a very weird scenario. It was one of those odd games but in terms of the three points it was really important." On Langford, Pulling added: "He played really well. I think we've been creating enough chances in the majority of games we've played in. "The problem we've got is finding a way is to work harder to stop the other team scoring. We need to try and eliminate some mistakes, then we'd be not too bad." 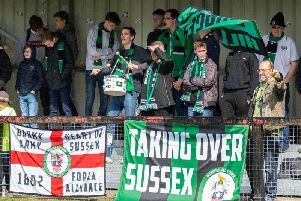 Lancing travel to Hendon tomorrow night in the FA Cup, having been reinstated in the competition after Phoenix Sports were dumped out after fielding a suspended player. Lancing: Shaw; Tighe (Willard, 61), Sharman, Bygraves, Knight, L.Pittock, Tredrea (F.Pittock, 61), Saunders, Langford, Pulling, Daniel. Subs: Di Arienzo.